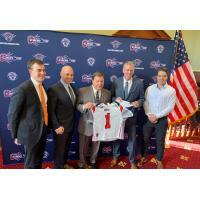 QUINCY, MA - The Boston Cannons of Major League Lacrosse (MLL) and the City of Quincy announced a new partnership today that will make Veterans Memorial Stadium the home of the Boston Cannons beginning in the 2019 season. As part of the multi-year agreement, the Cannons will make a significant investment to enhance the historic stadium. The Cannons will play their first of eight home games at the stadium on June 1 vs. the Ohio Machine. "The Boston Cannons organization is both excited and proud to call Veterans Memorial Stadium our new home," said Ian Frenette, President of the Boston Cannons. "With the expanding Major League Lacrosse schedule, it was an opportunity for us to assess the best possible home for our organization and we're thrilled to partner with Mayor Koch and the City of Quincy. Along with game days, moving to the stadium provides our organization a greater opportunity to grow the game of lacrosse throughout Greater Boston with increased youth clinics, camps, tournaments and presence." "Veterans Memorial Stadium provides great convenience to our fans, located just eight miles from Boston and easily accessible by Interstate-93 and the MBTA Red Line. We have plans to expand our game-day experience with music and festival-like elements as well as adding new world-class seating and corporate entertainment experiences for our fans," Frenette continued. "We know lacrosse fans, the business community and people from all over Massachusetts and New England are going to enjoy experiencing our games at the stadium. Quincy has seen tremendous growth as a city under Mayor Koch's leadership and we're excited to be a part of that momentum while providing our fans with an amazing venue and experience to watch the Cannons and the best lacrosse in the world." Mayor Thomas P Koch shared, "The Boston Cannons will offer the city of Quincy a professional sports venue as well as contribute funds for improvements to Veterans Memorial Stadium that will benefit our young athletes and spectators. Families and friends can share Saturday summer nights in the city enjoying this dynamic team." The Cannons have strong roots in Quincy and the South Shore. In 2016, the Cannons moved their executive offices to Quincy. Cannons Majority Owner, Rob Hale, is the Founder, President and CEO of Quincy-based Granite Telecommunications. Founded in 2002, Granite provides telecommunications services for companies in North America including 85 of the Fortune 100 companies and is consistently recognized annually as a top charitable contributor in Massachusetts. Rob Hale is also a South Shore resident and a co-owner and Board Member of the Boston Celtics. Veterans Memorial Stadium can seat more than 5,000 and is used by Quincy High School and North Quincy High School football, as well as youth, club and high school soccer and lacrosse and other community organizations. The Cannons most recently called Harvard Stadium their home. The Cannons will begin the 2019 season as part of Major League Lacrosse's new post-Memorial Day schedule with an expanded 16-game season (eight home, eight away), increased by two games from previous seasons. Season tickets go on sale on Tuesday, December 11 at 10:00 am. For more information, email tickets@bostoncannons.com or call (617) 746-9933.